Davey Auto Sales > The St.Pierre Family! During the past few weeks, I have been seriously considering purchasing a car. My husband and I have visited a number of dealers in the Oshawa/Whitby area, talked with salesmen, and test driven our top choices. Earlier this week, I stopped at your business and was greeted by one of your salesmen, Glen. Glen was friendly, helpful, and professional and I felt he was one with whom I wanted to do business with. After telling him what I wanted, he quickly found the right fit for us and a deal was quickly made. After the the 2012 Ford Fusion arrived on the Friday, my husband and I continued to complete the transaction in a most pleasant manner. The car was detailed, filled with gas, and Glen explained its features. He assisted us thoroughly and we truly appreciated his friendly and professional demeanor. Most folks generally have a negative experience in the car dealing experience I believe, however, salesmen like Glen made this positive for us. We will gladly recommend Davey Auto Sales to others. 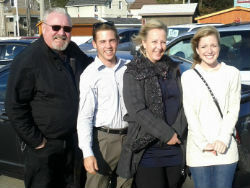 Dealing with Glen was the motivation to purchase a wonderful, exciting fully loaded car from Davey Auto Sales.